This is the first year that Daughter Person has received small sums of money directly for any holiday – $5 from finding the affikomen at Passover, and $12 from Easter eggs – and we’re not sure what to do with it. Usually, we’re given a check to put towards her college fund, so we dutifully cash it and transfer that amount to her 529 account. This year, we feel like it should be *her* money, and not go into her 529 account. But, we’re not sure if we can use it to teach her about money – she can barely count to 10, much less understand the concept of dollars and cents. 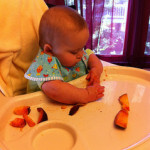 I was figuring I’d wait until she could count to (or at least understand the concept of) one hundred. She knows we have to pay for things – when we go to the grocery, she’ll carry her bag of goldfish (my bribe to get her to behave long enough for me to actually shop) up to the counter and lay it on the belt for the cashier, but I don’t think we’ve ever discussed amounts – how much we’re paying for things. I was thinking we could let her buy a doll or other trinket with it, but I don’t think she’d understand the concept of “not enough money” yet – although $17 is enough to buy most of the little things she tends to want/ask for. The other option is to add it to her savings account – the catch there is that I add a little bit of money there for her every month to use when she’s older. We have a S is for Savings account open at PNC for her – and I think she’d understand the jars “save, spend, share” – but we’re back at the question of what to save for or how much to save. Or maybe it just sits there until she’s ready to learn? Any of my readers have ideas on introducing money to young ones (she’s just over 3)? This entry was posted in Finances, Parenting on April 22, 2014 by Mom. Daughter Person has been potty trained for #1 for the last 6 months, and has gone over a month with no accidents outside of sleeping (nap/bedtime). She’s even doing pretty good with the naps as long as we can get to her when she’s just waking up and convince her to use the potty. We tried a few nights to let her sleep without a diaper, but she soaks herself and doesn’t wake up, so I don’t think we’re there yet. We’ll let her decide when she wants to sleep without a diaper. #2 is going to be our nemesis. She used to try #2 in the potty – about 25% of the time, now she’s just refusing to use it and uses her undies instead. At this point, we’ve tried bribing, cajoling, shaming, and begging. We’ve moved on to the “have it your way kid, we’ll just let you walk around in it for a few minutes” phase. She *loves* Pixar’s “Cars”, and I spent way more than I probably should have to create a “goodie bag” of Cars things she can pick from if she does #2 on the potty. She gets shown this bag at least daily, and it still hasn’t helped – she hasn’t been able to pick one single thing from it in almost a month. Night time is the only time we’re using diapers, and I’m getting a few of the older ones ready to re-sell to a friend who’s due in April (she asked if she could buy them from us, so I’m giving her a reduced price). Pretty soon, we’ll have 5 diapers (out of the approximately 32 we started with). Hopefully, by the time she’s 4, she’ll be able to stay dry at night too! I’m continuing this year with trying to rid our house of another 365 things. I’ve already made a bit of a start. But I’m going through the storage closets in the basement and in our crawl space. Dad might let me into his office to see about getting rid of more things. Our TV room has a lot of furniture in it that we want to get rid of and replace with one entertainment center, so there is a lot of opportunity there. My goal is to pick one room a month to purge – clothes, toys, knick knacks, etc. Daughter Person’s room is this month. The donation box is overflowing with old books and toys. I’m finally getting rid of the 24 month clothes she still has floating around, and some diapering things that we don’t need any more. Much of it is going into a box to offer to my expecting friend – she gets first rights of refusal, but she’s having a boy, so not many of the clothes are suitable. I have promised Dad that the basement will be finished this year (I would like to have it done before summer, but that might be pushing it)! I’ve already scraped out the carpet glue inside the closets that have already been cleared of carpet, so we can store things in them until it comes time to do the tile. I’ve gotten rid of several things that were taking up space via freecycle. I have to move a few things around so Dad can remove the rest of the carpet, and I can get started on getting up more carpet glue. This entry was posted in Home, Parenting and tagged 365 less things, goals on January 20, 2014 by Mom. In honor of Mental Health Awareness Week, I’m speaking out about my disease and how it has affected me and my family. I had no history of depression in my life (I’m adopted, so I don’t know about my birth parents’ medical history), and most people would have called me outgoing, extremely cheerful, and anything *except* depressed. But about 5 months after Daughter Person was born, I was diagnosed with post-partum depression – a “major depressive disorder”. Looking back on my pregnancy, it was very likely that I had antenatal depression as well, although never diagnosed. This entry was posted in Health, Parenting on October 7, 2013 by Mom. Before I launch into my post, I don’t want to seem as if I’m pushing one feeding method over another. I voluntarily chose to not breastfeed (after trying for 6 weeks) for multiple reasons – the primary one being my sanity. I support any woman in whichever choice she makes to feed her child, whether voluntarily or involuntarily. This is simply a post about how you would save money if you breastfeed. Bottles are required for formula feeding, but not for breastfeeding (but you’ll probably still buy some anyway so you can take a break), so I’m not including the prices of bottles in this calculation. Notice that all of these things are listed as “optional”? They weren’t for me, but they’re not really *required* to nurse a child. We were *very* lucky in that Daughter Person did not have any special needs or allergies where we needed special formula. If your child does have such needs, triple or quadruple the numbers below. We used Kirkland (Costco) brand formula for Daughter Person, $17/canister, and each canister made 262 oz of formula – $0.15/oz. When you formula feed, you *will* make too much formula at once and have to throw some out, so I’m using the amounts we actually made, not just what Daughter Person actually drank. Daughter Person also drank very little compared to some of my friends’ children, so these would just be estimates for any other child, and probably on the low side. Then from 6 months to a year, she drank about 4 feedings of 6oz each per day: $648 At that point, we switched to whole milk. 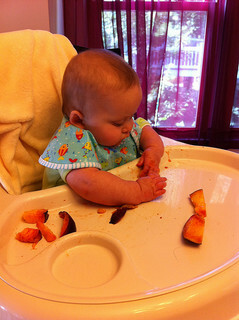 We started feeding her solid food at 6 months, and she slowed down on formula consumption at that point. Some kids drink as much as 8oz or more at a feeding when they get close to 6months, but not Daughter Person, so your mileage may vary. You could save anywhere from $1,000 to $1,500 (or more if you need to use a special formula) by exclusively breastfeeding, so it’s a good economical choice if you have that option. This entry was posted in Finances, Parenting and tagged breastfeeding, saving money with baby on September 3, 2013 by Mom. One of the major costs of a baby is the pregnancy and giving birth. A home birth is an option that some people should consider in order to save money. Daughter Person was born at home with the assistance from midwives. They charged $3500 to my insurance company, and I paid $20 – for *everything* from the midwives. There are some “hidden” costs that you learn about as you go along, but they did not exceed $1200 (and some of it was reimbursed by my insurance). A home birth is not for everyone. It’s only available to “normal” pregnancies – anything high-risk means you have to begin working with an obstetrician (twins, gestational diabetes, high blood pressure, breech baby, etc). There is no pain medication available – and I know that’s important to many people. There is always the risk of an emergency, and you’re not already in the hospital. There are also definite benefits: you’re at home, someplace you are comfortable and “relaxed” – or as relaxed as possible while in labor. There is no “going home”, because you’re already home. I was out and about visiting the afternoon after Daughter Person was born (not the best idea in hindsight, but *shrug*). Why did I choose a home birth? It wasn’t for any financial reason – we had excellent insurance, and I would have paid about $500 total for a hospital birth – although, I’ve heard that an epidural is considered “elective” and insurance doesn’t cover it, but I can’t confirm that. I did a home birth for the simple reason that I *hate* hospitals. I am extremely needlephobic, and just the thought of getting blood drawn “just because” was enough to keep me from getting pregnant to start with. Until I found my midwives (Birthcare & Womens Health). They offer an introductory session every month, and I attended and asked questions. I could get by with 2 needles total – assuming everything went well, and we decided to take the risk. The fear of needles was stronger than the fear of labor pain – and for any woman who’s given birth, that gives you an idea of how much I hate needles – I still would rather go through labor again than have blood drawn. There are many differing statistics on the safety of home birth – and much of it depends on the skills of the midwives. As any couple who’s been pregnant can tell you, there are *many* things that can possibly go wrong during a pregnancy and birth, and you can’t necessarily be prepared for all of them – whether at home or in a hospital. So many women choose a hospital on the off chance of something going wrong – they’re already in the hospital. Home birth midwives focus on reducing the risks that something will go wrong – that’s why any high-risk pregnancy cannot attempt a home birth. There are also backup plans in place in case something does go wrong. My midwives work closely with an obstetrician who will take emergency cases. If anything had started going wrong, I would have been transferred to the closest hospital via ER. If I had decided that *I* wanted to be in the hospital for any reason (like pain medication), we would transfer to the obstetrician’s primary hospital. Luckily, I made it through pregnancy and delivery without any major issues (although there were some close calls). But home birth midwives are aware of the risks, tell their patients ahead of time and let their patients decide. There are some “hidden” costs to home birth that are not easily available. The first is that my midwives required that we attend a natural birthing class: $175. The second is that we have to provide a majority of the disposable supplies: $85. The final cost is that the midwives work with a birthing assistant (also a nurses’ assistant), and we have to pay for their services. Our birthing assistant charged $800. 80% of this was reimbursed by my insurance company, but it’s also a cost that we paid up front. So our total costs including the midwives (assuming no insurance) would have been $4,700. That’s a lot less than the quoted $30,000-$50,000 average for a hospital birth. One question I get often when people hear that I gave birth at home is “how was it?”. I won’t go into details, but it was both long, hard and empowering. I didn’t really notice the midwife checking vital signs periodically, and I was relatively comfortable at home. I could eat what I want, when I wanted, I could get in the shower if I wanted, I could pretty much do anything I wanted within reason. After Daughter Person was born I felt very empowered and strong. I had really done that. The midwife stayed around until 4 hours after Daughter Person was born to make sure everyone was OK, and then we were left at home as a new family of three. Not to say that women can’t feel this way with a hospital birth, but that’s my experience. Daughter Person did have to go into the NICU when she was 3 days old, but not for any reason related to the home birth – she developed severe jaundice and needed a blood transfusion. I’m happy to answer any other questions you might have about my home birth. Feel free to comment or e-mail me directly: mom at 3isplenty dot com. This entry was posted in Finances, Parenting and tagged baby, home birth, saving money, saving money with baby on August 14, 2013 by Mom. Now that we’re almost out of diapers (at least during the day), I wanted to post what I think we saved by going with cloth diapers over disposables. Daughter Person has been in cloth diapers ever since we brought her home from the NICU. She had a horrible reaction to the diapers they put on her in the hospital, and her whole diaper area looked “burned” the entire time she was there. We had already bought the cloth diapers prior to her birth, but that week in the NICU really hardened our resolve to stay with cloth. 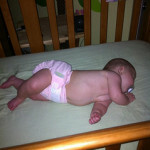 I bought 24 newborn BumGenius diapers for her first few months. I bought them new for $12.95 each ($310.80), and resold them for $10 each on eBay when we were done with them (-$240.00). We have 32 of the one-size pockets (BumGenius), which I bought for ~$16.50 each ($528.00) – I bought them in multi-packs 🙂 I’ve also bought new inserts for 25 of them for $15 shipped free on the slow boat from china ($15). I’ve also bought 25 “refresh” kits to replace the velcro on the larger diapers, they’re $1 each ($25). I’ve not started reselling the diapers yet, but I plan to, and they’re going for about $7-$10 each on eBay depending on condition – I’m going to guess we’re at the $7/diaper side. So far, I’ve spent $638.80 on regular cloth diapers. We went straight to undies for potty training, and we use cloth swim diapers as well ($14.95 each, and I’ve bought 3 – $44.85). We have three wet bags for her diaper pail ($16.50 each), and two travel wet bags ($11.95 each). For all Daughter Person’s cloth needs, we’ve spent $757.05. What would we have spent on disposables for the same time period? Assuming that we used store brand diapers (which may or may not have worked for us, I have no idea), I’m going to use Target’s prices for their brand. Finally, for the last month, we’ve been in undies and diapers at night and nap. We change undies about 5 times per day, and she’d be in pull-ups: that’s 150 changes at .34 per pull-up: $51. Not to mention the swim diapers we’d have had to buy through all this, we’d have spent $1,024 on just regular diapers. That’s a difference of $266.95 and we haven’t even sold our cloth diapers yet (an estimated $224. And this is just for one kid! We’re not having another, so those are pretty much our final costs for the cloth diapers. If you had more than one kid, you’d save even more. Using cloth diapers is a bit different than disposables (but not that much!). We have to wash them every 2-3 days. It involves a cold rinse, hot wash, then low dry, and that’s it. It’s just two-three extra loads of laundry per week, which wasn’t that much considering we were already doing all the laundry for her (and my) clothes. There was some cost to the laundering, but I don’t think it was that significant, and we could have line dried to keep it lower. We found a daycare center that was willing to work with us using the cloth. We stuffed the inserts into the diapers when we did laundry, and from then on, it was just like a disposable diaper – except you don’t throw away the old one. They’d put them in a bag and we’d take them home to wash, and bring in the same number the next morning. Poop is one reason many give for not using cloth. There are multiple options here. 1) babies who are exclusively breastfed (not Daughter Person) have water soluble poop – nothing special needs to be done, just toss in the wash. 2) liners – you can buy liners which catch solids and you throw them away – we didn’t use those either. 3) a diaper sprayer (or toilet): you rinse off the solids into the toilet, then wash the diaper. We used a sprayer to rinse off the big pieces of solids as soon as we removed the diaper, then put the wet diaper into the pail. Daycare left the solids in the diapers for us to rinse when we got home. It’s really not that bad. Especially since you end up covered in poop anyway, no matter what diaper you use! Cloth diapers are not for everyone, they take some planning ahead and easy access to washing facilities. Dad preferred the cloth diapers to the disposable ones she was in in the NICU (so did I). I think they’re just easier to use – and they certainly look more colorful! This entry was posted in Finances, Home, Parenting and tagged baby, cloth diapers, saving money on August 12, 2013 by Mom.